I saw this skirt on the Ann Taylor site months ago. I knew I had a piece of blue cotton eyelet in the collection. All that I would need to make my own version of it would be a similar lace...and for the temperatures to get a little warmer. Well the temps are finally summer-like here, so over Memorial Day weekend, I made my version of the Ann Taylor skirt. My first challenge was to determine if I wanted the skirt lined or underlined. I went with underlined to make it easier to handle the seams. After the pieces were basted together and then serged to finish the edges, the skirt went together easily. I did add rayon seam binding to the edge of the skirt's waistline before folding it over to insert the elastic. I just wanted a clean finish on that edge. 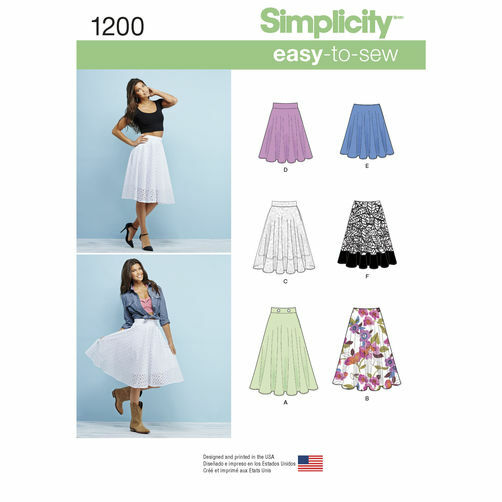 The most important feature of the skirt is the lace at the hemline. To attach mine, there are three rows of stitching to keep it laying flat on the hemline. A lot of thread that's basically invisible but I felt necessary to keep the trim on the skirt. I love the transparency of the lace at the hemline. I'm beautiful and I think it shows in the pictures she takes! Both of these have the silhouette you would need to interpret the Ann Taylor skirt. The best thing about this "simple" silhouette is that once again it had some details which made it interesting to sew. I can sew "fast and easy" but it doesn't satisfy as creatively as the more complicated sews do. This skirt will work fabulously in my work wardrobe with some slip on sneakers or it can be worn hanging out with friends with heels. I wish I remembered how much the skirt cost because it's no longer on the website, probably in the $99-130 range, since that's an average of skirts presently on Ann Taylor's site. I definitely saved by making my own version but the important thing is that Ann Taylor skirts only go up to a size 14-16, so I couldn't have purchased this anyway. Even though this wasn't a cheap knock-off, I'm thrilled that I've found a way to interpret RTW and/or designer goods again for this stage of my life. One thing though, because of the lining and cotton eyelet this skirt is a little heavy and warmer than my normal summer skirts. I know why AT showed this as a spring skirt now. I just couldn't wrap my mind around the fact that it would work in spring like temps. Now that it's officially summer weather here, this might not get worn until September, and I'm fine with that. Hey it gives me a new piece to start my fall wardrobe with...but it is the dangers of not sewing spring garments earlier in the year! Your skirt is really lovely, and the lace matches the eyelet fabric beautifully. I think I want to try one too :) Been loving everything you make lately. You do look gorgeous in these photos. Looks like you are having a great hair day! Carolyn, I really love this skirt! I agree with your daughter, btw - you are beautiful! I find your blog inspirational on a lot of levels so keep the posts coming! Oh, I love the transparency at the hem! your daughter thinks you are beautiful. I agree with her, you are a beautiful woman and a rol model for me. I agree with everyone else here: You áre beautiful. and this gorgeous skirt is the icing on the cake! Beautiful! This skirt really makes an elegant impact, and it looks like one of those pieces that is easily dressed up or down. Really nice! Beautiful skirt on a beautiful lady. Your skirt is lovely! Thanks for a great blog, I always look foward to reading it. Your daughter is correct, you are beautiful! You are one of my favourite stylists as well and I love, love, love your shoe collection, including those slip on sneakers. So want. Your skirt is so pretty and the lace trim is perfect, well done. Once again your designer interpretations knock off is out of the park! I'm a bit envious of your access to super cool trims - last week I was trying to figure out if I could get up to Nancy's on a bus, during my lunch hour. I think the 'Carolyn' skirt pattern (which I think is still available) would also work, but man that burda envelope pattern is a stunner! Thank you for matching current patterns with your OOP TNT pieces - it really does help people who are inspired by your creations. Gaylen - I had to go and see if the pattern was still online. I'm surprised that it is! It's been awhile since I made one of these skirts. Need to pull the pattern out again. I will try to remember to link to new patterns in future blog posts. Thanks for the love. You have a beautiful spirit which shines through in pictures and in your blog content. Love the skirt too. You are beautiful. Love the skirt and the mules. The skirt is darling. Now I want one too. Thanks for sharing your RTW interpretation. What a gorgeous skirt! Thanks for the inspiration. Your daughter does a wonderful job as photographer! Yes ma'am, read your last few posts and love the garments! I agree, you have a great eye for design and styling, and great skill in constructing your garments. Really enjoy the photography as well, and yes, you do beam and look so natural in your photos! Kudos to your daughter! Great job with this skirt. Very much like your inspiration skirt! Really pretty! I am a sucker for navy blue eyelet...and the lace at the hemline is perfect!! Great make. Very pretty! I bought some navy lace last year because I wanted (needed!) a lace skirt in that gorgeous color. It is really fantastic and the lace makes it extra special. Gorgeous! What a great skirt, Carolyn! I love how you've used that lace border! What a beautiful skirt- it looks really great on you! Lovely skirt, Carolyn. I want one too. Great match with the lace to the fabric. Very nice! Oh Carolyn, yours is so much nicer than the original!